Successfully Added External Battery Back Case for Samsung Galaxy Note 4 - 5500mAh Maximum Capacity, 1.2A Maximum Output to your Shopping Cart. 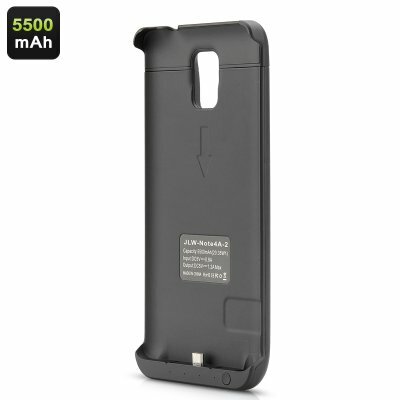 This External Battery Back Case for Samsung Galaxy has a 5500mAh Maximum Capacity and a 1.2A Maximum Output. Bought a Samsung Galaxy Note 4? Not enough battery juice when you are out and about doing your day-to-day routine? Then this external battery is just what you need. Replace the existing back cover with this one and have an extra 5500mAh battery capacity to keep you going longer. Play games more, message more, talk more and generally use this phone more. The polymer lithium battery has a maximum output of DV5V, 1.2A plus there are four LED indicators lights to show how much power is left before needing a recharge. Compatible Models for this back case are the Samsung Galaxy Note 4 N9100, N9108V, N9106W and N9109W. This product is in stock now, we guarantee next working day shipping and offer a 12 months warranty on all our products. Brought to you by the leader in electronic devices as well as wholesale Samsung Accessories, Chinavasion.